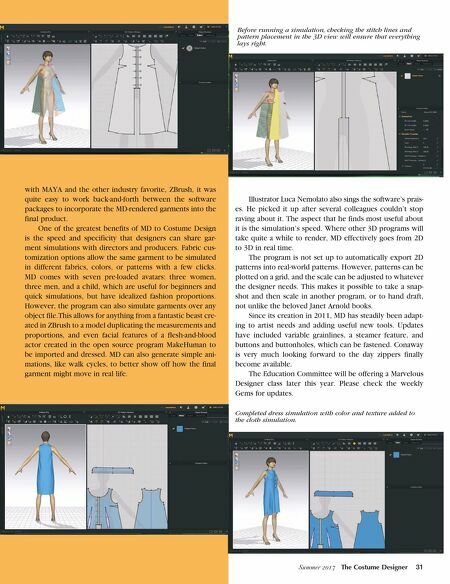 30 The Costume Designer Summer 2017 Mar velous Designer While fairly new to the market, Marvelous Designer (MD) has quickly become a "must learn" for the gaming and film animation industries. With our costume illustrators pres- ently adopting the software, it is now making its way into Costume Design. The powerful CAD program translates 2D patterns into 3D garment simulations in real time, and each new software update adds useful new features. An early convert to the technology was Costume Designer Gwyn Conaway. Conaway saw the less-than- stellar quality of Costume Design in otherwise visually spectacular games as an opportunity. She started taking courses in illustration and MAYA, 3D animation, model- ing, simulation, and rendering software of choice for most major CGI projects, before branching out to MD. Conaway found that the triangular wireframe geom- etry—rather than square—of the MD software was much better suited to simulating the drape and movement of fabric. Also, since files created in MD are fully compatible By Christine Cover Ferro Buttons and buttonholes can be plotted and fastened.